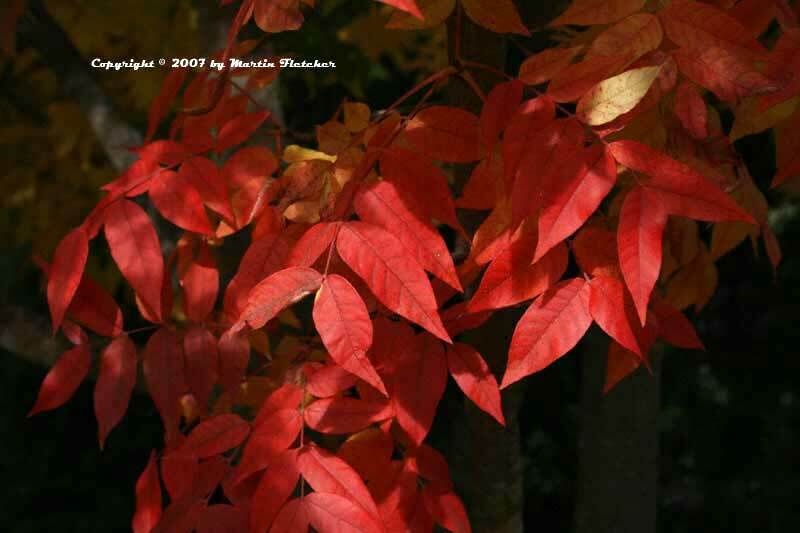 In our area Chinese Pistache produces more consistant Fall color than any other tree I have seen. Pistacia chinensis has a moderate growth rate. Most Pistacia chinensis trees that I see around town are in the 20 foot range with one specimen 30 feet tall. The trees are dioecious, with the female trees bearing small 1/8" nuts. Pistacia chinensis can easily be propagated by seed. Some people purchase grafted male plants for this reason. I like to see brilliant fall foliage like that of the Chinese Pistache against a dark backdrop such as pines. Pistacia chinensis is hardy, readily surviving Winter temperatures of 20° F.
Reliable red leaves in Fall - Pistacia chinensis - Chinese Pistache. High resolution photos are part of our garden image collection.